The Mi 8 has sparked some controversy since it was announced at the end of last month. While it's true its back is see-through, some of the exposed components — such as the Qualcomm Snapdragon 845 chip and the accompanying modules — aren't actually real; they're dummies for aesthetic purposes. The first thing you'll notice about the phone is the glossy glass panel at the back. It's quite blingy, to say the least. 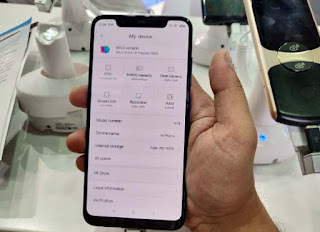 The blue colour variant I had in my hands looked a lot like the Honor 10. There's the vertically aligned dual cameras at the corner and Xiaomi even packs a fingerprint sensor at the back on top of the of 'top-notch' face unlock. The rear panel is pretty minimal otherwise. 2018 has seen a lot of smartphones try and ape the iPhone X. The notch, the vertical dual cameras and in some cases, even the construction and design. Well, no other phone comes close to being the Android-iPhone X as the Xiaomi Mi 8. Xiaomi's flagship for this year blatantly copies Apple's marquee device but that doesn't necessarily take anything away from it. In fact, the Mi 8 felt quite powerful for the few minutes I had it in my hand at MWC Shanghai 2018. The Mi 8 this time packs a 6.28-inch Super AMOLED panel of full HD resolution with the new 19:9 aspect ratio. The extra real estate is there thanks to the notch. It's wider than most other Android phones with notches and that's because Xiaomi packs an infrared sensor to allow face unlock even at night. It's not the same as the 3D face detection that the iPhone X has, but it at least has the advantage of working despite the lighting condition. 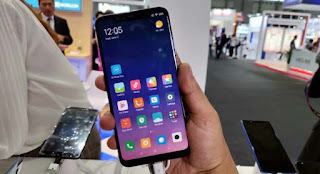 Nevertheless, Xiaomi's flagship this year is a monster when it comes to specifications, but more than that, it felt like a charm to use the phone. Up front is mostly all screen. There are thin bezels around the edges but the display is quite immersive. The panel is HDR10 compliant and supports the DCI-P3 colour gamut, something that the iPhone X also boasts of. Does it feel as immersive as the iPhone X? It certainly seemed so. There's MIUI 9.5 inside that also draws a lot of inspiration from the iPhone X. Even the Settings menu and multi-tasking pane are similar to iOS. I would take away points from the phone for that, but it remains to be one of the most functional UIs among those that don't conform to stock Android standards. Xiaomi has even added some AI-centric features including its own version of a voice assistant. That's only in China for now and if Xiaomi launches this phone in India, chances are it won't be pre-installed. There's AI in the camera as well. It's essentially computational photography that uses machine learning to improve the photos. The Mi 8 has twin 12-megapixel cameras at the back with f/1.8 aperture and 4-axis OIS. The camera is certainly one of the strong points of the phone. Up front is a 20-megapixel shooter that also seemed quite capable of taking selfies enhances with AI. Despite a glass back, the Mi 8 doesn't support wireless charging which is a bummer. You do get the latest Snapdragon 845 chipset underneath coupled with 6GB of RAM and up to 256GB of storage. There is no option for expandable memory though. There are two bottom firing loudspeakers and a USB-Type C down below and on top is the IR blaster that has been a standard in all Xiaomi devices since forever. Overall, this seems like an excellent rival to the OnePlus 6 should Xiaomi ever decide to launch it in India. However, with the likes of the Oppo Find X and the Vivo Nex stealing all the limelight for actually innovating on bringing a truly bezel-less phone, Xiaomi's flagship this time might get lost in the chatter. Disclaimer : We are not Officials Portal, not affiliated with official support. So, don’t share your Personal information here. We posted this article for general information purpose only and all the information we share, are collected from different internet sources . Before taking any further step Please Confirm it form Official website Visit More . Admin is not responsible for any of your activity. Thank You. keep Visit Our Site Thanks! Please share the information with your friends! And subscribe the website for more Notification!